Your skip-the-line ticket to The Museum of Modern Art includes a free audio guide, special exhibitions, films, and gallery talks. 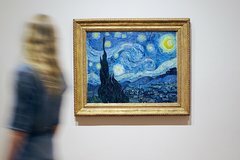 The MOMA's renowned collection of modern and contemporary art includes Vincent van Gogh’s The Starry Night and Andy Warhol’s Gold Marilyn Monroe, along with works by Jackson Pollock, Jasper Johns, Cindy Sherman, Elizabeth Murray, and many other great artists of our time. Bonus: Admission to MoMA PS1, the contemporary art center in Long Island City, is also included for up to 14 days after your visit to MoMA. The Museum of Modern Art is a place that fuels creativity, ignites minds, and provides inspiration. With extraordinary exhibitions and the world's finest collection of modern and contemporary art, MoMA is dedicated to the conversation between the past and the present, the established and the experimental. Masterpieces like Vincent van Gogh’s The Starry Night and Pablo Picasso’s Les Demoiselles d'Avignon are on view along with Andy Warhol’s Campbell’s Soup Cans and Gold Marilyn Monroe. Henri Matisse, Claude Monet, Frida Kahlo, Salvador Dali, Roy Lichtenstein, Jasper Johns, and many more can be found in the midtown Manhattan museum. The rich and varied collection of The Museum of Modern Art constitutes one of the most comprehensive and panoramic views into modern art. From an initial gift of eight prints and one drawing, The Museum of Modern Art's collection has grown to include over 150,000 paintings, sculptures, drawings, prints, photographs, architectural models and drawings, and design objects. MoMA also owns around 22,000 films and four million film stills; and the Museum screens films on a daily basis. With an admission ticket to MoMA, you will also have up to 14 days to visit MoMA PS1, which is located only two subway stops away in Long Island City. Visitors will enjoy one of the world’s largest organizations devoted to contemporary art. A true artistic laboratory, MoMA PS1 aspires to maintain its diverse and innovative activities to continue to bring contemporary art to international audiences.